ARMN member Samantha Gallagher combined a talent for graphic art—and advocacy—to make a Protect Pollinators license plate a reality in Virginia. Read on…. The efforts of ARMN’s own Samantha Gallagher just keep generating wonderful benefits for pollinators. Samantha has always loved bees and other pollinators, advocating for them from a young age. When she moved to Virginia a few years ago, she learned that the state had a specialty license plate for wildflowers, but not for pollinators. So she decided to do something about it. 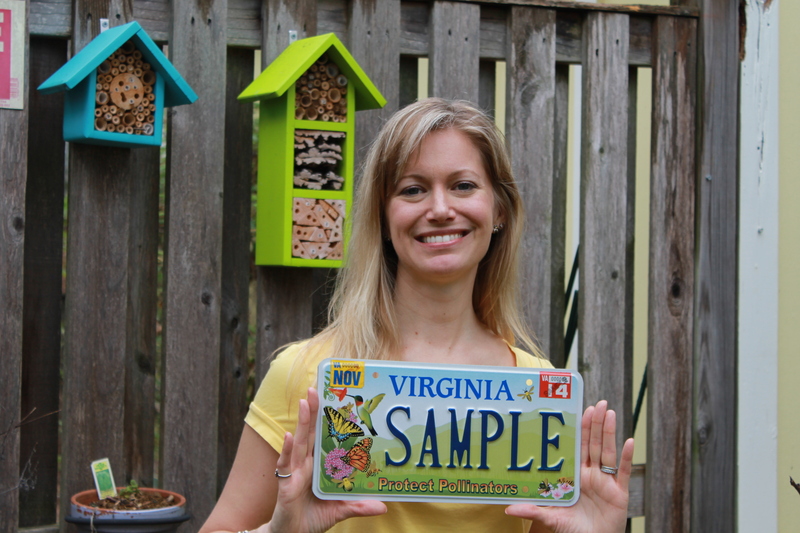 Using her skills as a graphic artist, Samantha designed a custom plate that features Virginia native pollinators, and in 2010, began the long process to gain approval for a Protect Pollinators license plate. Samantha Gallagher holds a sample Protect Pollinators license plate. Photo courtesy of Claire Harper and The Zebra. Once she submitted the proposal to the Virginia Department of Motor Vehicles, the hardest part of the process began: getting 450 people to commit to purchasing the license plate and pay the specialty-plate fee in advance. The effort took four long years, with Samantha attending Earth Day activities, nature festivals, and any event even vaguely connected with pollinators. During that time she also kept in touch with those who pledged to buy the plate with her upbeat reassurances that it would become a reality. After Samantha gathered the required applications, she still needed a state legislator to sponsor a bill to approve the pollinator plate. She found a perfect ally in someone who had already introduced pro-pollinator legislation: Virginia Senator Creigh Deeds. In January 2014, Deeds introduced the bill “to authorize the issuance of special license plates for supporters of pollinator conservation bearing the legend: PROTECT POLLINATORS.” On April 6, 2014, the bill became law. While this was a wonderful accomplishment, it isn’t the end of the story. In the summer of 2014, Nicole Hamilton of Loudoun Wildlife Conservancy had a brilliant idea. She had watched with despair as medians filled with milkweed and other wildflowers were mowed time and time again. She wondered: Can we simply change the mowing schedule to allow this valuable resource to continue growing for migrating Monarchs? And, ideally, use medians along Virginia’s highways to plant more milkweed and other native flowering pollinator plants as well? 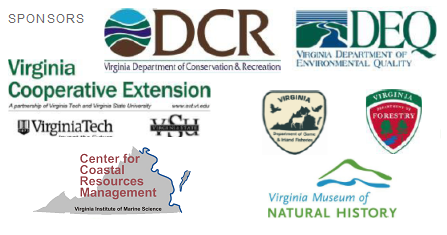 She contacted the Virginia Department of Transportation (VDOT) regarding changes to the mowing schedule for existing patches of milkweed and scheduled a meeting with VDOT’s vegetation management. She invited Samantha to attend the initial meeting as well; while Nicole could speak about the Monarchs, Samantha could speak about our native bees. 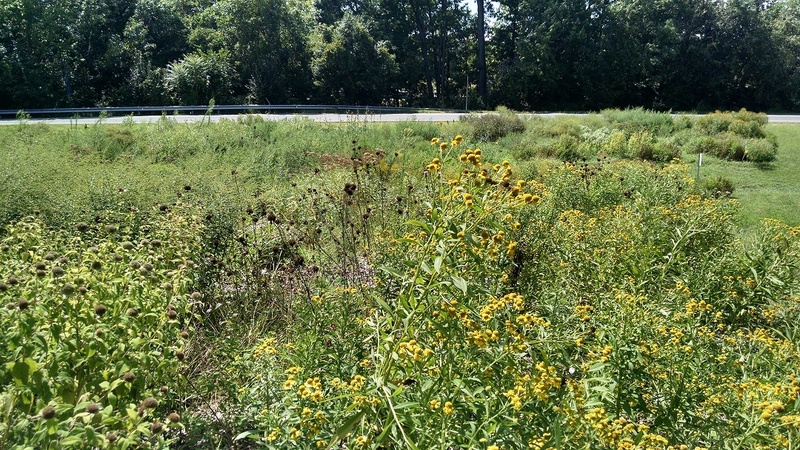 Pollinator meadow at Dale City rest stop. Photo courtesy of Samantha Gallagher. To make changes to the existing legislation, Samantha contacted local Senator George Barker, who agreed to sponsor an amendment to ensure that the revenue from the pollinator plate would be used strictly for the Pollinator Habitat Program. In July 2016, with more than 5,000 plates now on the road, the pollinator plates officially began generating revenue for the new program. To learn how to get your own Protect Pollinators license plate and find out more about why this effort is so important, visit Samantha’s pollinator plate website at: http://www.pollinatorplates.com/. To read the full story of Samantha’s efforts to make the pollinator plate a reality, see Tom Sherman’s article, “The Bees, Creigh Deeds, and the DMV,” in The Zebra: http://thezebra.org/the-bees-creigh-deeds-and-the-dmv/.